Sierra Buttes is north of Hwy 80, more or less between Grass Valley and Truckee, rising dramatically above the town of Sierra City. 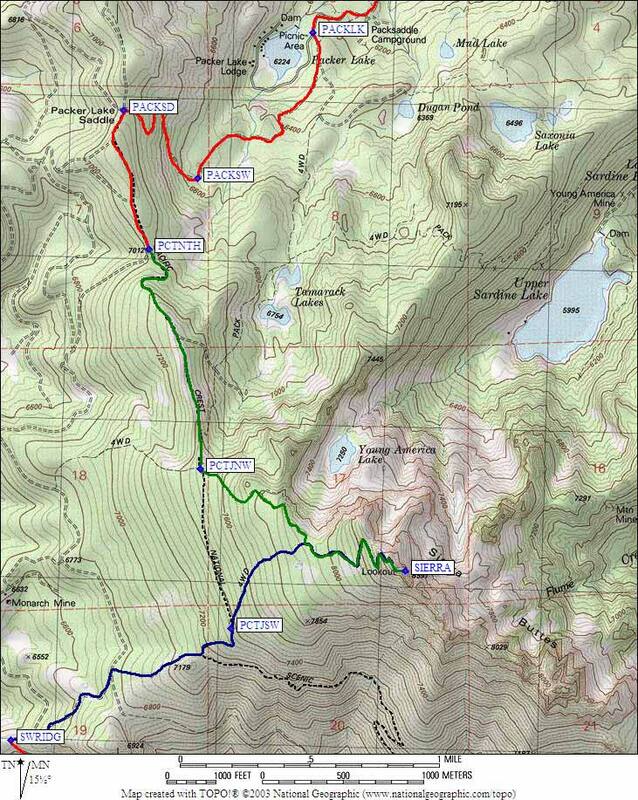 Maps showing these waypoints are below (wide view of highways, an overview of all trailheads, details of the winter approach on the south side) and the summer approach on the north side). There are two general approaches to the area: If you prefer freeway driving you should go to Truckee and take Hwy 89 north to Hwy 49, then turn west to the trailheads at Sierraville (where I can recommend Los Dos Hermanos restaurant, open until 8pm all year). If you prefer two-lane driving along the Yuba River you should take Hwy 49 all the way from Auburn through Grass Valley and Downieville (or take Hwy 174 from Colfax to Grass Valley). Which route is faster depends on traffic and your driving habits! The apparently direct route going north from Emigrant Gap does not work very well since there is no connector between the North and Middle Yuba Rivers (south of Sierra City). The Sardine Lake campground is accessible all year, free with no services in the winter. No permit is required, call the Downieville Ranger Station 530-288-3231 for road conditions. The east face of Sierra Buttes is, according to one trip report, "a tremendous jagged sheared monolith of quartz porphyry, weathered to a mournful purple." That means it's a great morning view from Sardine Lake. The south face is dry, brushy, rocky, and dotted with old mines and mine roads. The northern and western approaches are open forest with lots of 4WD roads suitable for skis or snowshoes in the winter and crowded with motorized vehicles in the summer. 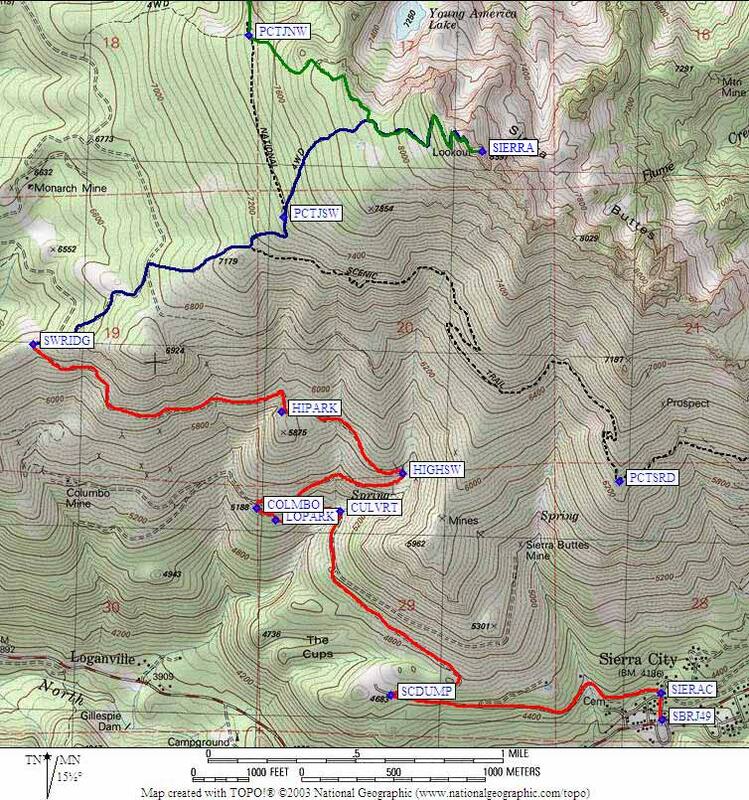 The Pacific Crest Trail (PCT) runs through this area (the green line connecting PCTJ49 with PCTNTH), but for the most part climbers will approach on roads instead of the PCT. Winter climbers can start far above Sierra City (waypoint SCDUMP, LOPARK, or HIPARK) because the south side snow melts quickly after a storm. Summer climbers can drive regular passenger cars within an hour's hike to the summit (waypoint PCTNTH) using the northern approach. Scroll down for north and south side entry details. This web page ignores the PCT from Hwy 49 (weaypiont PCTJ49) because it's a shorter and easier to walk up the 4WD road from Sierra City (SBRJ49). NOTE: Another winter option is to park at the turnoff to Sardine Lake (waypoint SARDLK) and follow the ridge north of the lakes, detouring through Tamarack Lakes to reach the west slopes above Young America Lakes. We thought about this and scoped the route from above, but it's more miles. Leave Hwy 49 in the tiny town of Sierra City (no winter services), following Sierra Buttes Road at the sign for the Sierra City Dump (waypoint SBRJ49). Very shortly you 'leave town' by turning left (west) at waypoint SIERAC. This well graded dirt road goes west to the dump entrance (waypoint SCDUMP), then heads uphill to where a large stream flows under the road in a culvert (waypoint CULVRT). Between that stream and the turnoff to the Columbo Mine (waypoint COLMBO, the next switchback) is a small stream and a clump of trees where you can pull several vehicles off the road and camp with some shelter (waypoint LOPARK). Above COLMBO the road deteriorates a bit and passenger cars may not make it. Any high clearance vehicle should be OK since the road appears to be well maintained as 4WD roads go. Due to snow and several large boulders blocking the road in April, we parked at waypoint HIPARK, a spur road that ends at Point 5875'. A short stroll (or drive, if it's open) leads to the southwest ridge (waypoint SWRIDG) where the terrain changes abruptly from scrub to tall pines. Snowmobile tracks in this area may or may not follow roads marked on the maps (the blue line), but we found it easy to follow a compass bearing or just keep the SW ridge in view. The forest is open enough and the terrain is gentle enough that there's no need to search for a road or trail in the winter. Can't say what it's like when bare! Once above waypoint PCTJSW, it's a straight shot to the peak (waypoint SIERRA). The last hundred feet is on stairs up to a lookout tower. They may be drifted over or iced up so crampons and ice axe would be wise. You can probably snowshoe to the saddle just north of the tower, then traverse from there to the stairs. Leave Hwy 49 at the Gold Lake Highway (waypoint GLHJ49) as shown on the map of all trailheads. In winter, the road will not be plowed past Sardine Lake, which makes this mostly a summer approach. NOTE: A winter option is to park at the turnoff to Sardine Lake (waypoint SARDLK) and follow the ridge north of the lakes, detouring through Tamarack Lakes to reach the west slopes above Young America Lakes. We thought about this and scoped the route from above, but it's more miles. Go past the turnoffs to Sardine Lake (waypoint SARDLK) and Packer Lake (waypoint PACKLK) and drive up the steep but paved road to Packer Lake Saddle (waypoint PACKSD). There's a short section of dirt road to the Pacific Crest Trail (PCT) trailhead at waypoint PCTNTH but it's fine for regular passenger cars. From this trailhead it's about an hour to stroll to the summit (waypoints PCTJNW and SIERRA), including those famous stairs to the fire lookout tower.